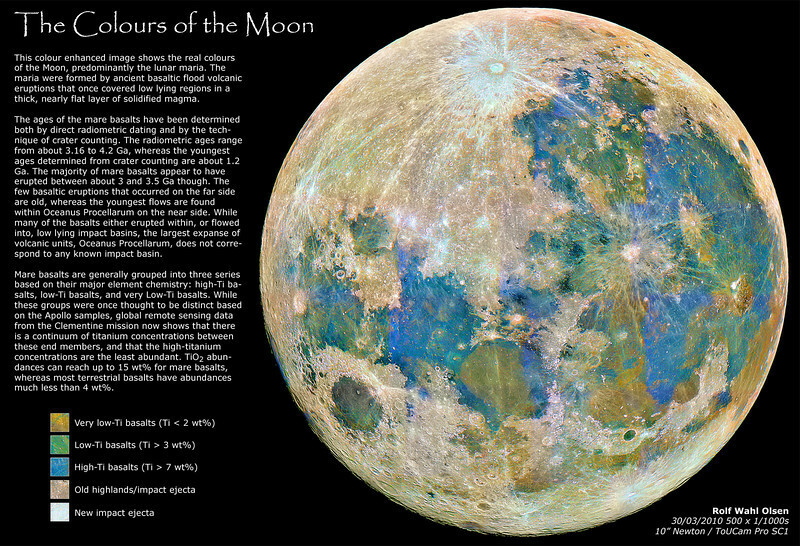 This colour enhanced image shows the real colours of the Moon, predominantly the lunar maria. The maria were formed by ancient basaltic flood volcanic eruptions that once covered low lying regions in a thick, nearly flat layer of solidified magma. The image is a mosaic of 24 panels taken with the ToUCam's 640x480 resolution. Each panel is a stack of 500 1/1000s frames, which provided for very low noise levels. The result was then heavily colour saturated and a copy of the original image was added as luminosity layer. The result is a lunar mineral map which clearly shows the distribution of titanium minerals on the lunar surface. Mare basalts are generally grouped into three series based on their major element chemistry: high-Ti basalts, low-Ti basalts, and very Low-Ti basalts. While these groups were once thought to be distinct based on the Apollo samples, global remote sensing data from the Clementine mission now shows that there is a continuum of titanium concentrations between these end members, and that the high-titanium concentrations are the least abundant. TiO2 abundances can reach up to 15 wt% for mare basalts, whereas most terrestrial basalts have abundances much less than 4 wt%.